Frank Bloksberg Sensei began training in Aikido in Southern California in the early 1970s. After training for a few years, Frank Sensei left active training and went on to become a professional musician and then lawyer. Frank Sensei went back to active training when his young son, Alex, came home from school and explained that a nice teacher there was offering Aikido lessons. When Alex began training, Frank Sensei joined in. By the way, that nice teacher is Asia Currie. Frank Sensei actively trains with his teacher, Michael Friedl Shihan (Aikido of Ashland, Oregon) and, whenever possible, Frank Doran Shihan (Aikido West in Redwood City). Up until opening Aikido’Ka, Frank Sensei was a member of Mountain Wind Aikido in Nevada City, California and a student of Jan Kirkpatrick Sensei. Here is a sampling of other teachers Frank Sensei has trained with and who have significantly influenced his training and teaching: Hiroshi Ikeda Shihan (Boulder Aikikai), Cyndy Hayashi Sensei (Aikido West), Kimberly Richardson Sensei (Two Cranes Aikido), Julio Toribio Sensei (Monterey Budokan), Danielle Smith Sensei (Aikido of Monterey), Tom Gambell Sensei (East Bay Aikido), Craig Fife Sensei (Aikido Northwest) and Chuck Hauk Sensei (Aikido of Eugene). Frank Sensei’s teaching is influenced by his study of the bio-mechanical aspects of Aikido. When performed properly, Aikido looks and feels like magic. But, magic has nothing to do with it. Rather, Aikido techniques are ingenious applications of the laws of physics. Frank Sensei emphasizes martially effective Aikido. The study and practice of Aikido principles help Frank Sensei in all aspects of his life. As a litigation attorney, Frank Sensei deals with people who are under tremendous stress. These people are often looking for some kind of fight. Likewise, some attorneys approach practicing law as if it were a type of war. Aikido principles and training help Frank Sensei work to unravel disputes and make resolving them much easier. In his law practice, Frank Sensei represents only people and small companies. While Frank Sensei has experience representing large corporations, he has not done so in years. While large corporations have their pick of excellent lawyers, the average person can have a very difficult time hiring a first-rate lawyer. Frank Sensei provides that representation. To contact Frank Sensei about legal or dispute resolution issues, please call him at his office at (530) 478-0170. Mark teaches our Thursday evening weapons classes with Jane Hill. Mark also teaches our ukemi lab classes on Sunday. The ukemi classes are are true dojo favorite. The classes are not simply about how to fall. 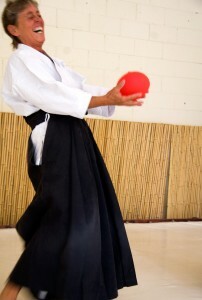 Instead, the ukemi classes are a close study of how to bring and maintain a martially effective attack and maintain that spirit throughout the technique — all in the spirit of cooperation critical to successful practice. Mark is also our leading dojo trainer for people working on black belt level testing. Mark has been Linda Holiday Sensei’s student (Aikido of Santa Cruz) since he began training in 1990. Here is a sampling of other teachers Mark has trained with and who have significantly influenced his training and teaching: Michael Friedl Shihan (Aikido of Ashland), Richard Strozzi Heckler Sensei (Two Rock Aikido), Kimberly Richardson Sensei (Two Cranes Aikido) and Jamie Zimron Sensei. Jane teaches our Thursday evening weapons classes with Mark Zwagerman. She emphasizes solid, basic aikido and weapons training. Jane also emphasizes having fun in training. Jane has been training for over 20 years, and holds black belts in aikido and Seibukan jujutsu. She loves to train and travels to other dojos on a regular basis. Jane is a retired travel agent and has traveled throughout the world extensively. In fact, Jane continues to love visiting exotic and amazing places. Jane Hill actively trains with her teacher, Michael Friedl Shihan (Aikido of Ashland, Oregon) and, when possible, Frank Doran Shihan (Aikido West in Redwood City). Up until Aikido’Ka opened, Jane Hill was a member of Mountain Wind Aikido in Nevada City, California and a student of Jan Kirkpatrick Sensei. Molly Sensei co-teaches our Friday evening open aikido class with her husband, Jeramy Hale. Molly Sensei is an extraordinary person who teaches aikido around the world. She earned her 4th degree black belt from her long time teacher Frank Doran Shihan (Aikido West). In 1995, Molly Sensei broke her neck in a car crash and became quadriplegic. She was told that she would never have voluntary movement below her shoulders. Molly Sensei refused to accept that prognosis. She believed instead in herself, in her body’s ability to communicate and heal, in her spirit’s astounding resolve, and in the capacity of her family and friends to support her recovery. In late 2017, Molly Sensei was invited to be part of the Aikido Disability Working Group. The Working Group is part of International Aikido Federation (IAF). It focuses on aikido training for people with a variety of disabilities. 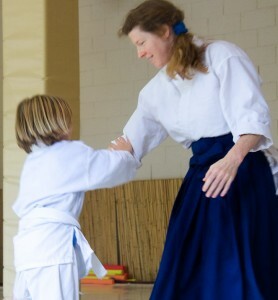 Molly Sensei will represent the United States in the Aikido Disability Working Group. In 2002, Molly Sensei was an Olympic Torch Bearer. She is often called upon to be a keynote speaker or presenter at events relating to healthy living and healing. Molly Sensei is a Founder and Director of Ability Production, a nonprofit company. A documentary about Molly Sensei, Moment by Moment: The Healing Journey of Molly Hale, premiered in 2003. Jeramy Sensei co-teaches our Friday evening open aikido class with his wife, Molly Hale. Jeramy Sensei is simply a fantastic person and a first-rate teacher. We are incredibly lucky to have him train and teach at the dojo. He earned his 4th degree black belt from his teacher of almost 30 years, Frank Doran Shihan (Aikido West). Jeramy is also a 1st degree blackbelt and founding member of Seibukan Jujutsu. Since 1995 Jeramy Sensei has been actively involved with his wife Molly Hale, in researching and documenting the challenges of spinal cord and other traumatic injuries. Jeramy Sensei is a Certified Aging In Place Specialist (CAPS) with the National Association of Home Builders and AARP. He is also a graduate of the Executive Certificate in Home Modification Program from the University of Southern California. Jeramy Sensei likes to help educate others about universal and accessible design, He lives with the demand for accessible, practical and functional living space design every day since his wife Molly Sensei’s spinal cord injury and resulting quadriplegia in 1995. Jeramy and Molly Senseis both are speakers and presenters in the fields of universal design and how to modify homes for access and visitability. Jeramy Sensei has a diverse background in business and life experience. He was a partner in Seed Center, an independent book publishing company with two national best-sellers, and he was the co-founder and President of Sugo Music, an international music company for 16 years. Asia has been training for over 20 years. Asia teaches our AikiTots class for youngsters 3-5+ years old. Asia is also the artist-in-residence at Nevada City School of the Arts. Asia actively trains at Aikido’Ka. She also trains with Danielle Smith Sensei, Michael Friedl Shihan (Aikido of Ashland, Oregon) and, when possible, Frank Doran Shihan (Aikido West in Redwood City). Up until Aikido’Ka opened, Asia Currie was a member of Mountain Wind Aikido in Nevada City, California and a student of Jan Kirkpatrick Sensei. Eric is the powerful force behind our amazing strength and conditioning program. 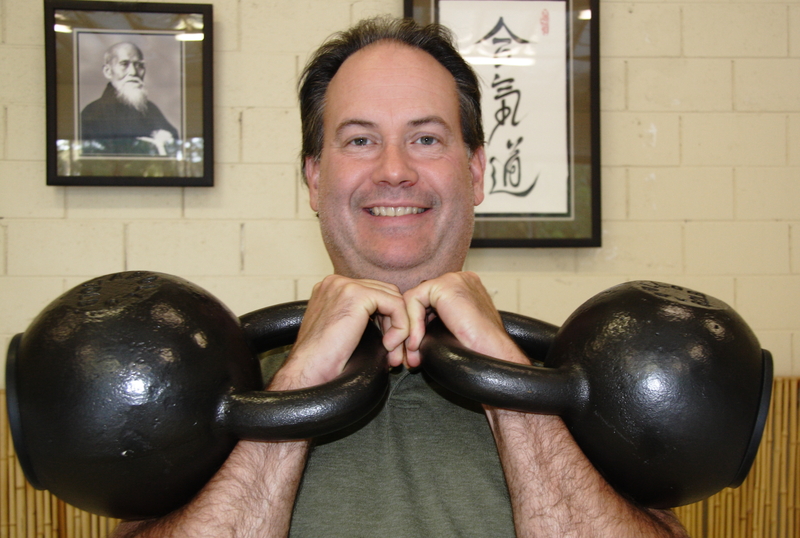 Strong First Girya (SFG) certified instructor (Girya is the Russian word for kettlebell). Russian Kettlebell Challenge (RKC) certified instructor. Functional Movement Specialist (FMS) movement screening and restoration certified. Eric Kenyon has been training athletes and non-athletes, in the San Francisco Bay area, Gold Country and beyond since 1999. He draws on a lifetime of competing in a variety of sports from youth to college level, a very active stretch in the US Army, and full time study & practice of Soviet sports science since 2002. Eric’s style of instruction is very different from mainstream fitness training. Eric focuses on adept, natural movement, rather than working muscles or body parts in isolation. This makes for extremely well balanced and resilient athletes. These days Eric’s students range from retired seniors improving their golf game to US Navy SEALs. These local professionals also depend on Eric for top level conditioning: Wild land & structural firefighters, Nevada County Sheriffs, professional aerialists, dancers & acrobats, and serious martial artists. • Attended cutting edge Easy Strength Seminar in Reno with Pavel Tsatsouline and Master RKC and Master SFG Dan John.